Dubbed as some of the Best Pizza in Chicago, Pequod's may be considered in a class of its own. Unfortunately, this class is not deep-dish... but rather pan-style pizza. Besides the pan-style pizza, they are famous for their "caramelized crust" (see description below). In a city with one-of-a-kind deep dish pizza, it is hard for other places to get established, but Pequod's did just that. The atmosphere of the restaurant is very "bar-like." It is definitely a place to check out... but definitely try it out after going to all the deep dish places. (I did carry-out so I can't comment on the wait or the staffing). This is the pizza with the infamous "caramelized crust." This pan-style pizza has a thick, soft crust almost like a focaccia bread. The next layer is the cheese, which is laid on pretty thick. And finally, on top is the tomato sauce. The sauce has a nice tanginess to it which I really enjoy. The crust though was by far the best part. It was caramelized over since the cheese bubbled and burnt at the edges. It even had a little sweetness to it and was extremely crispy. I have heard the crust varies each order and sometimes it is too burnt to enjoy. We must have gotten lucky. 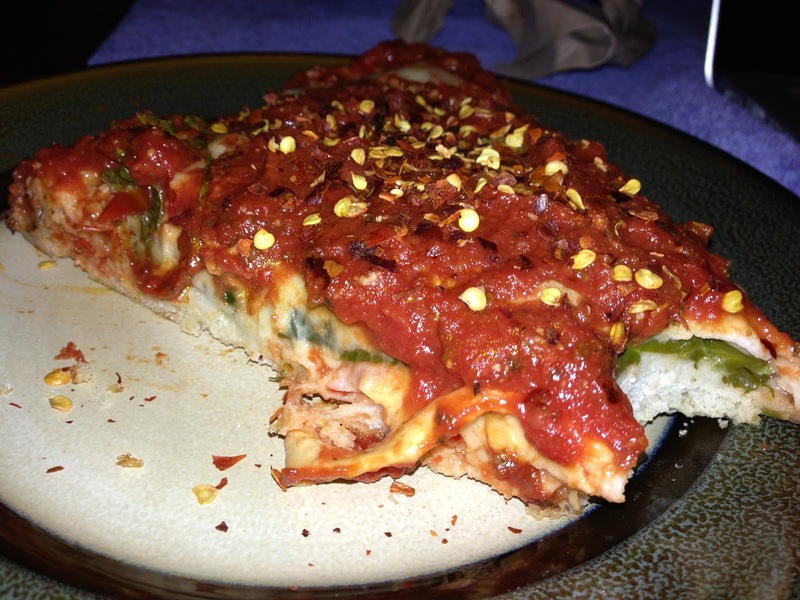 It is great crust, but still not deep dish style. So if you decide to come here, don't expect to get a deep dish pizza. Their pizza is way different, and definitely not Chicago Style. (As you can see in the picture, we got half spinach and half cheese... this way we could try two different kinds). As mentioned in the previous description for Cheese pizza, the crust is the main part of the pizza. 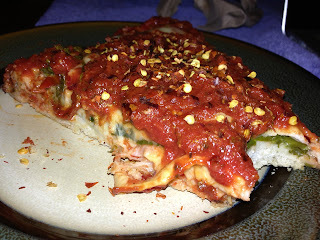 The spinach was laid on pretty generously, but the tangy tomato sauce and the thick crust actually overpowered any spinach flavor that should have been present. I did taste more of the spinach the day after when eating it cold, but that sort of defeats the purpose. It was good, but I suggest getting a topping with a sharper or stronger flavor. This is the thin crust option at Pequod's. It is a little cheaper, but for the amount of pizza, I thought it was pretty expensive. We ordered a small thin crust so we could try the different style... and it wasn't that great. The crust was dry to a point where the edges would break apart on one bite. Also, it was not seasoned well at all. We got jalapeño peppers and pineapple as our toppings which definitely was a great choice. The sweet and spicy is a great alternative to the Hawaiian style. I wouldn't order thin crust again, but its all preference. - It seems like a great place to watch football or other sporting events. - The restaurant is small, so if you have a good sized party, make sure to get their early or call ahead for a reservation. - If you hear that they have the best pizza in Chicago... I wouldn't get too excited. The pizza is good, but it is NOT deep dish or Chicago-style pizza. I've never seen nor heard of pizza with a caramelized crust before. I'm actually so curious that I'll see if my private chef bristol can cook one up for dinner. caramelized crust is great. i think the use of their pans over and over again for years adds to it! Seriously, jalapeno and pineapple thin crust pizza is a blast when I saw it. Hopefully I still have the same comment once I tasted it. And I like the idea of caramelized crust, the cheese pan pizza looks yummy because of it. Do they provide delivery cary nc services as well?